We use many different techniques we use in our massage and bodywork. Our therapists are skilled in a variety of modalities, and may use many of these techniques in a single massage session. Let us know if there is a specific type of work you are interested in, or simply tell us what your needs are and we will customize a massage based intuitively on what we feel will be best for you. We will customize a massage for you according to your needs using a mixture of the following modalities. Let us know if you are interested in any one particular style. Swedish Massage is a very relaxing and therapeutic style of bodywork. It combines oils or lotion with an array of strokes such as rolling, kneading, and percussion to help the relieve muscular tension and improve circulation. The benefits of this type of bodywork are wide-ranging and include relief from aches and pains, decreased stress, enhanced mental clarity, and greater flexibility. Deep Tissue Massage is a form of bodywork that aims to relieve tension in the deeper layers of tissue in the body. Deep Tissue Massage is a highly effective method for releasing chronic stress areas due to misalignment, repetitive motions, and past lingering injuries. Deep Tissue massage should never be painful, although at times it may be intense. Your therapist will encourage open communication during the session to make sure you stay relaxed and comfortable. Sports Massage is a type of massage designed for highly active people who engage in athletics. Sports Massage enhances performance and prolongs a sports career by helping to prevent injury, reduce pains and swelling in the body, relax the mind, increase flexibility, and dramatically improve recovery rates. Sports Massage is also highly effective in aiding the rapid recovery of an athlete from an injury by encouraging greater kinesthetic awareness and in turn promoting the body’s natural immune function. Myofascial Release is a very effective hands-on technique that provides sustained pressure into myofascial restrictions to eliminate pain and restore motion. The theory of Myofascial Release requires an understanding of the fascial system (or connective tissue). The fascia is a specialized system of the body that has an appearance similar to a spider’s web or a sweater. Trigger Point Therapy is a style of bodywork that focuses on stimulating and releasing “trigger points” in your body. These ‘knots’ are built up throughout a person’s life due to physical, mental, and/or emotional stress. During a session, focused pressure is applied through a variety of techniques in order to release your trigger points. Reflexology is a science that deals with the principle that there are reflex areas in the feet and hands that correspond to all the glands, organs and parts of the body. Reflexology is a unique method of using the thumb and fingers on these reflex areas, to relieve stress and tension, promote the unblocking of nerve impulses and improve blood supply in the whole body. Reflexology helps nature achieve homeostasis and has an impressive ability to facilitate healing in the body. Bamboo Fusion Massage is an exotic and effective treatment that is delivered with hand crafted, custom designed bamboo tools to give a deep luxurious massage without discomfort. Smooth, warmed bamboo is applied to the body with long, soothing rythmical strokes and rolling movements, dissolving knots and smoothing fascia. Bamboo Fusion massage brings a deep sensation of relaxation and well-being to both body and mind. Pregnancy Massage is a style of bodywork designed specifically for pregnant women. Pregnancy is a time when a woman’s body endures tremendous stress due to dramatic physical and emotional changes. Using various techniques specially developed for the expecting mother, Pregnancy Massage helps release the pain and discomfort experienced throughout pregnancy. The benefits are profound, including emotional support, the relief of joint pain due to extra weight and postural imbalance, and improved breathing and relaxation. ASHIATSU (ASHI = FOOT, ATSU = PRESSURE) is an ancient form of bodywork that started with the Buddhist Monks, first from China, then from Thailand and Japan. This unique deep work is done with the therapist’s feet using the power of the legs and the weight of the body to impact the deeper muscle layers. Perfect for those who prefer deep massage, as well as those with thick or well-developed muscles who have trouble feeling the impact of massage done with the hands. 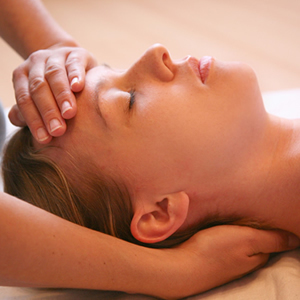 CranioSacral Therapy is a bodywork method that focuses on gently stimulating your CranioSacral system (membranes and fluid that surround the brain and spinal cord) to heal the body by improving the functioning of the central nervous system. CST effectively complements your body’s natural healing process, and has been known to help alleviate a wide variety of problems including Central Nervous System Disorders, Chronic Fatigue Syndrome, TMJ, Fibromyalgia and more. Thai massage(Nuad Bo-rarn) is a traditional bodywork practice based on the principles of compassion(metta). This massage is done on a mat on the floor. You will remain fully clothed for the session, and no oils or lotions are used. Massage pressure is applied with hands, feet, elbows and knees along sen(energy) lines throughout the whole body while you are gently moved through passive yoga-like stretches and postures. Thai massage is both revitalizing and relaxing, and a session will address the whole body, promoting balance. As such, it can be helpful with a variety of ailments stemming from chronic imbalances, physical and otherwise. The LDT process involves the use of gentle manual maneuvers to aid in the recirculation of body fluids, stimulate functioning of the immune system, and balance the autonomic nervous system. It is a very light pressure technique, and is very relaxing. It can improve sinus problems, reduce edemas (swelling), relieve chronic and subacute inflammation, detoxify the body, provide deep relaxation to aid insomnia, depression, stress, loss of vitality and loss of memory, and more. Note: Jenn cannot work with patients who have lymphedema, or on patients with compromised lymph nodes. 4 Handed Massage is a truly unique and amazing experience that anyone who loves massage owes it to themselves to try. Be transported with a synchronized relaxation massage performed by two therapists at once. Treat yourself to an experience you will definitely not forget! Choose between two Swedish Massage therapists, or try a combination of one Swedish and one Bamboo Fusion Therapist. Couples massage is a fun way to relax with your spouse, close friend or family member. Make your date night extra special by starting or ending it with a massage together. Include us as part of your girls night out, or plan a relaxing afternoon with a friend to say thank you, or just for fun. Our couples massage suite is beautiful, relaxing and quiet. Let us make your next time out with a loved one better than ever! Hot Stone Therapy is a style of massage where heated stones are placed at specific sites on your body to deepen relaxation and promote circulation in your muscles. Your therapist will use a combination of her hands and the hot stones in fluid gliding strokes and kneading. Muscles that are heated with these stones release tension and stress much more deeply and quickly than with a traditional massage. The overall experience is very relaxing, nurturing, and rejuvenating.